Prohibition officially ended on Dec. 5, 1933. 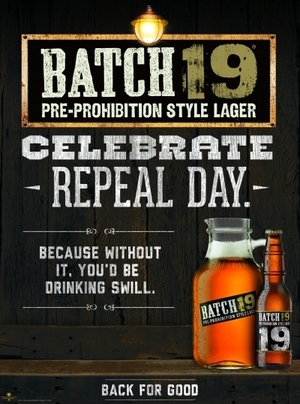 Eighty years later, Miller Coors’ Batch 19 beer is turning the milestone into a marketing event. Batch 19 wants to “own the holiday,” said Libby Mura, senor marketing director at Tenth and Blake, the craft and imports division for MillerCoors. Posted in Misc and tagged Arthur's Day, booze at 3:50 pm on November 26, 2013 by Broadsheet.